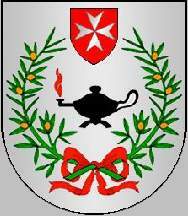 Shield Argent, an oil lamp Sable flamed Gules, surrounded by two olive branches Vert fruited Or and in base tied Gules, in chief an inescutcheon Gules charged with a Maltese cross Argent. Mural crown Argent with four visible towers (town rank) and white scroll with inscription in black initials "CARDIGOS". The cross is alluding to the Order of the Knights of Malta. Cardigos Commune is one of the six communes of Mação Municipality; it had 1086 inhabitants in 2011 and covers 71.3 km². Cardigos had been a town and seat of a municipality until the beginning of the 19th century, and it had been downgraded in 1801, having then just 1121 inhabitants. After the dissolution of its municipality it became part of Vila de Rei municipality and was incorporated into Mação municipality in 1878.